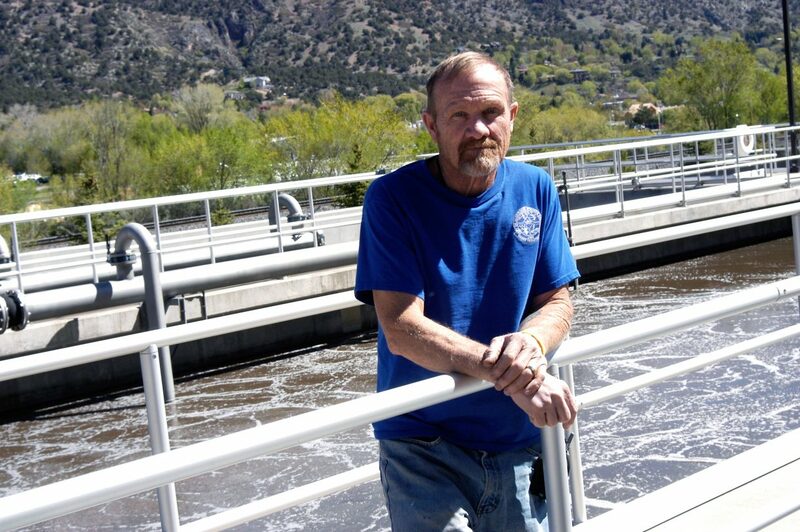 Buddy Burns, shown here at the new Glenwood Springs Wastewater Treatment Plant, has been with city public works for 38 years, including as water and wastewater superintendent since 1982. He retires on Monday. Buddy Burns had a goal to retire before he turned 61. And he will just make that self-imposed deadline when he officially retires Monday after 38 years with the city of Glenwood Springs. Burns, the longtime water and wastewater superintendent for the city, turns 61 on Tuesday. That’s when he officially begins making plans for himself and wife Sandy to move to Alaska. “No thinking about work, no schedules, no nothing,” Burns said Wednesday from his now mostly empty office at the Glenwood Springs Wastewater Treatment Plant. “The only thinking I want to worry about is what kind of gas and oil mixture my chain saw takes,” he said. Friends and co-workers will gather at the Glenwood Springs Community Center today for the traditional send-off party. Burns, who was born and raised in Rifle, got his start in public works while still in high school in the early 1970s when he landed a work-study job at the Rifle Water Plant. After three years in the U.S. Army training with the 25th Infantry in Hawaii, he was fortunate to be offered a job on his return home as a water and wastewater operator for the city of Rifle. At the time, the city was making the transition from its old trickling filter wastewater treatment system to a new, state-of-the-art rotator plant located at the confluence of the Roaring Fork and Colorado rivers. “I was really fortunate to be a part of that,” he says today from his office overlooking the even newer, much more state-of-the-art aerobic digester treatment plant above the Colorado River in West Glenwood. Burns recalls those early days taking care of nine pump stations throughout the city’s wastewater collection system and being ever-vigilant to make sure they didn’t back up and overflow. “We didn’t have any alarms then, and any time we would have an overflow it would go straight to the river,” he said. Wastewater treatment has come a long way in 38 years, he says of the new, high-tech, 1.9-million-gallon-per-day treatment plant that now serves the city. “This new plant is just mind boggling what it does,” Burns said. “For me, it was like I used to work on an old ’87 Ford and now I’m working on a 2014 Rolls Royce. “It was kind of scary at first, but it’s been a good learning curve for everyone,” he said. Five years into his long stint with the city he was asked to take over as wastewater superintendent, alongside water distribution superintendent Filbert Gonzalez. “He was a great mentor,” Burns said of his introduction to the municipal water side of his job before the two positions were combined. “He would let me make mistakes, but he would never let me fail. Burns also recalled being the new, young boss over a crew of mostly older city workers who had been around for a long time. When he implemented an on-call schedule for personnel to be available in the event of an emergency repair situation, one of workers said that wouldn’t work because he didn’t have a driver’s license. “He was very honest with me and said, ‘I decided a long time ago that I was either going to drive or I was going to drink, not both,’” Burns said, adding he relented so long as that worker kept his drinking to off hours. Burns has been kept busy in recent years overseeing a crew of seven wastewater collection and treatment workers, and eight water treatment and distribution workers. Along the way, Burns and his first wife, Cindy, raised two boys, Joshua, who passed away two years ago after a long battle with cancer, and his oldest son, Robert Burns, who followed in his dad’s career footsteps and now runs the city of Rifle Water Plant. Burns’ second wife, Sandy, is an active volunteer in the Silt community, helping with the Schneegas Wildlife Foundation rehabilitation center, and with the local senior center. After some traveling and visiting family in the coming months, Burns said they plant to relocate to the small town of Talkeetna, Alaska, just north of Anchorage.